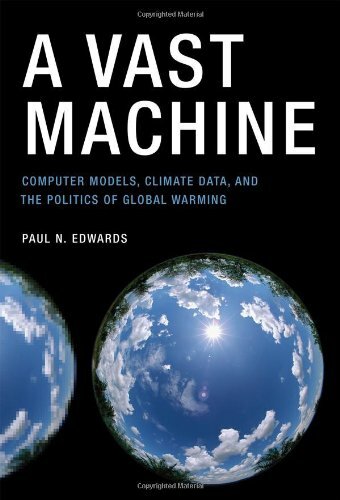 “Global warming skeptics often fall back on the argument that the scientific case for global warming is all model predictions, nothing but simulation; they warn us that we need to wait for real data, “sound science.” In A Vast Machine Paul Edwards has news for these doubters: without models, there are no data. Today, no collection of signals or observations–even from satellites, which can “see” the whole planet with a single instrument–becomes global in time and space without passing through a series of data models. Everything we know about the world’s climate we know through models. Edwards offers an engaging and innovative history of how scientists learned to understand the atmosphere–to measure it, trace its past, and model its future. Reviews: Noel Castree (American Scientist, 2010), Ronald E. Doel (American Historical Review, 2011), Myles Allen (Nature, 2010), Richard C.J. Somerville (Science, 2011), Gabriele Gramelsberger (Minerva, 2012), McKenzie Wark (White Review, 2014).